Great, phone is lighter grips to table tÃ²p but slides in and out my pocket easily looks good however it's too easy to wake up Bixby or change volume controÄº. I didn't realize the screen wasn't covered though. I have bought this before. Looks great when new. Clear and light. Discolours over time. It's quite a loose fit but works. The plastic cover does feel very rubbery, but it does look like it will provide good protection to the phone, and it doesn't appear to affect the sensitivity of the touch screen. I would imagine that would be perfect for someone working in a dusty area/have dirty on their hands. However, the plastic is made up of lots of little dots, which means when viewing images, they can look low quality, and plain fabric views as a spot pattern. Therefore, it is not for me, and I have removed the cover after just 2 days of use. There are many other products of this type available on the market. this one appears to be just as good however, only time will tell if it remains clear. In the past I have purchased lower cost products which proved to be satisfactory for 6months or so. The case fits well with good protection. Does all required of a case, whilst still maintaining the aesthetic of the phone. It also helps to overcome the weaknesses of the S8, i.e. inadvertent activation of the Bixbi Button and the tendance to slip under certain conditions. I wanted a thin phone case and this fits my requirements perfectly. This is a very light weight case which easily fits around the device and protects it. The accessory was easy to order and delivered very quickly. No complaints. After not recieving a response in regards to this item i feel i have no choice to leave negative feedback on this product. Unfortunately it is well over priced for its description, you could probably get the same item from a 99pence shop! To have forked out £10 in total for this item i am truly shocked with the end product. I am looking to return this item for a full refund and i will not be ordering from this manufacture ever again... I would rate no stars but it seems you cant do that! Not only thin and light, the surface is an admirable compromise between grippy to hold and smooth into and out of the pocket. The protection is perhaps minimal but that's the price for a case that is almost not there. And it's good value for money, I think. The cover is very good and does not hide the phone's color. I ordered a slim transparent case for my new samsung s8. I was looking for a slim case and found it. I love the 3 individual holes for the camera, flash and sensor. Price was great and delivery as well. This case is fantastic if you want something that almost looks like it isn't there! All the cut outs are in the right place and it is so slim and unobtrusive but gives good hold to an otherwise slippery phone. I didn't want to hide my beautiful phone and this case is perfect. Can also charge wirelessly without having to remove the case.Thank you mobile fun delivery was quicker than expected so very pleased. Goods as described, well packaged and delivered on time. A nice unobtrusive case that fits well! This case fits perfectly and is not loose at all on the s8 and all the cut outs line up almost perfectly. The clarity is very good letting you see the colour on the back of the phone. The gel material provides a nice amount of grip and you wont feel like it will slip out of your hand at all. Although it is very thin and makes it feel like there is no case on at all, the soft gel material offers a nice amount or resistance to bumps and scratches. 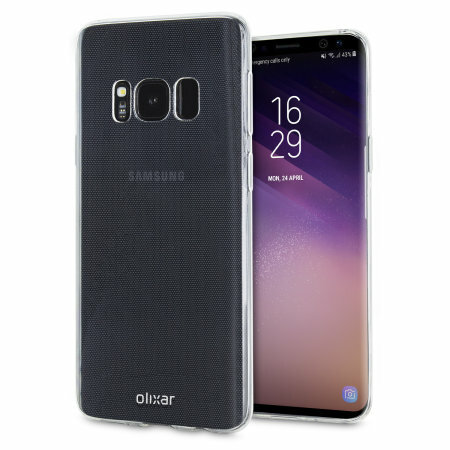 This case is perfect for anyone who wants to show off their phone and feel like there is no case while providing great scratch and bump protection and a bit of drop protection. The case was incredibly good value compared to those commonly available on the high street and is practically invisible. Very well made. Makes it easier to hold the otherwise slippery phone too. Excellent all-round. Tried Spigen Air and some other off brand Chinese case. Spigen cracked and the other was so thick that the side buttons didn't work. This one is a winner, ordering one more for my wife. This gell cover doez what its surposed to, gives hreat protection and does not affect the the buttons well worth the money! It's a very simple asseccory so either off is and does the job of not. This fis and does the job as it should, unlike the screen protector from same manufacture which is rubbish.